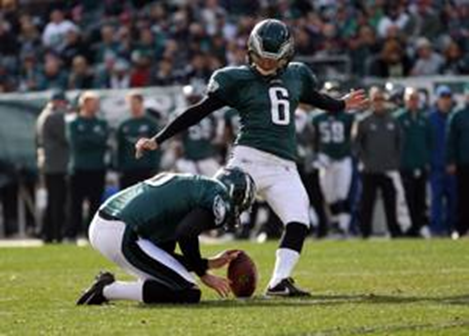 Five hours after his season ended, Alex Henery became the most accurate rookie placekicker in NFL history. Henery, the Eagles’ rookie fourth-round pick, made two more field goals Sunday in the Eagles’ season-ending 34-10 win over the Redskins at the Linc. After missing three of his first 11 kicks, Henery made his last 16 and finished the season with 24 field goals in 27 attempts (88.9 percent), which at the moment the Eagles’ season ended, tied Cowboys rookie Dan Bailey for the most accurate season ever by a rookie. Because the Cowboys were scheduled to play Sunday night, all it would take for Bailey to lock up the all-time NFL rookie kicking accuracy record was one field goal against the Giants without a miss. But Bailey missed his only attempt of the night -- a 51-yarder as the first half ended -- which dropped Bailey below Henery and gave Henery the title of most accurate rookie kicker in NFL history. Bailey finished 32 for 37 (86.5 percent). Henery, the all-time NCAA career accuracy record holder at 90 percent, also broke David Akers’ franchise record for field goal accuracy in a season. Akers held the record at 88.2 percent, set in 2002 (30 for 34). Two of Henery’s misses came from inside 40 yards in a one-point loss to the 49ers. The other was a longshot 63-yarder against the Falcons. Without that Falcons attempt, Henery would have been in the 92-percent neighborhood and be finishing one of the 20 most-accurate seasons in NFL history. After the 49ers game, Henery was perfect, going 16 for 16. If he makes his first field goal attempt of 2012, he’ll tie Akers’ franchise record for most consecutive field goals made. Phil Dawson "is more than the team's MVP"